What is the Right Necklace Length for Me? The long and short of necklace lengths: the right measurement will showcase jewelry, accentuate features and frame the face. 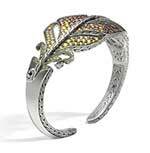 Local luxury jewelry retailer J.R. Dunn Jewelers cares about people, places and things. Owners Jim Dunn, Ann Marie Dunn and Sean Dunn are actively involved in a number of charities, giving of both their time and money. The John Hardy jewelry name has become synonymous with “sustainable luxury” in the industry; and the designer’s Classic Chain collection presents one of many beautiful variations. The traditional craftsmanship and nature-inspired feather-fashioned pieces that recently made a debut have all the makings of becoming a timeless heirloom for future generations to wear and enjoy. As John Hardy enters into its fourth decade, there seems to be no end in sight for the legions of admirers who follow and wear treasured pieces of jewelry; the level of desire for John Hardy jewelry shows no signs of diminishing any time soon. You’ve found the girl, now it’s time to find the engagement ring. Where do you start? A good beginning is to narrow down the seemingly endless possibilities by researching the latest trends. And remember: less stress means greater success!